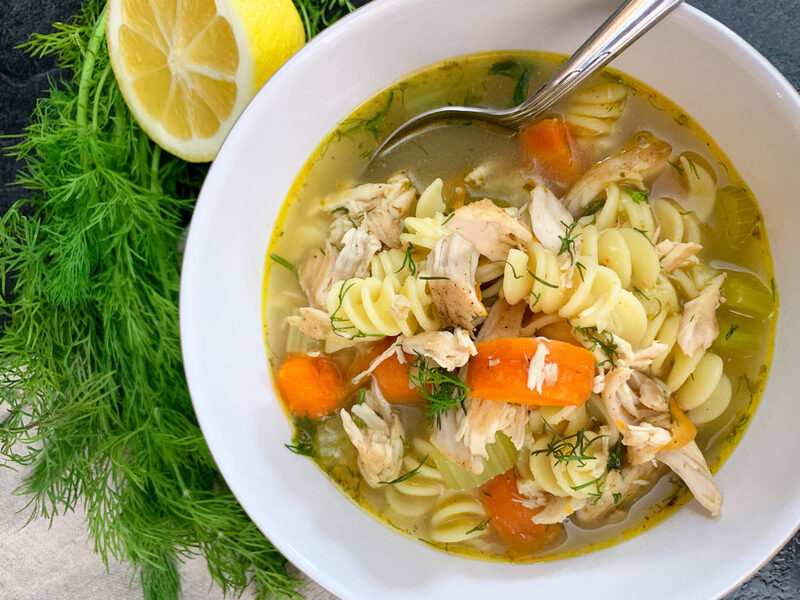 This week I was feeling a little under the weather, so I decided to make a big pot of my favourite Flu Fighter Chicken Noodle Soup! 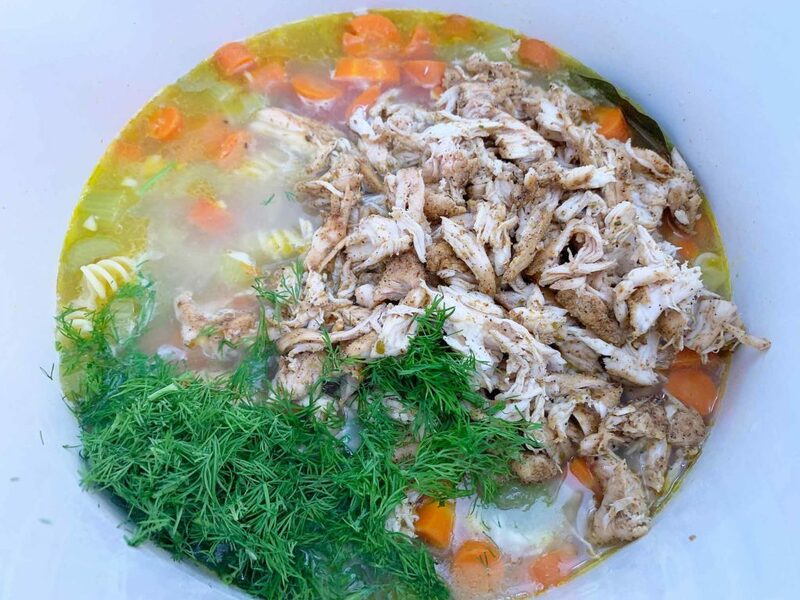 I discovered the recipe for this soup a couple of years ago, and it has since become a staple of mine to help me make it through the cold and flu season. This is not a gentle soup. This is a hearty, spiced, clear your nasal passages kind of soup. It’s loaded with a delicious combination of garlic, lemon, cayenne pepper and fresh dill. The original recipe comes from Baker by Nature. The first time I made this, I loved the flavour, but found the spice level to be a bit too intense for me. I usually reduce the amount of spice a bit, and add a few extra veggies. Since we have an onion allergy in the house, I also omit the onion. What I love most about this soup is how quick and easy it is to prepare. After all, when you’re sick and feeling miserable, you don’t want to spend hours standing beside a stove! You start by preparing the chicken. You can either buy pre-cut chicken tenders, or slice up some chicken breasts. 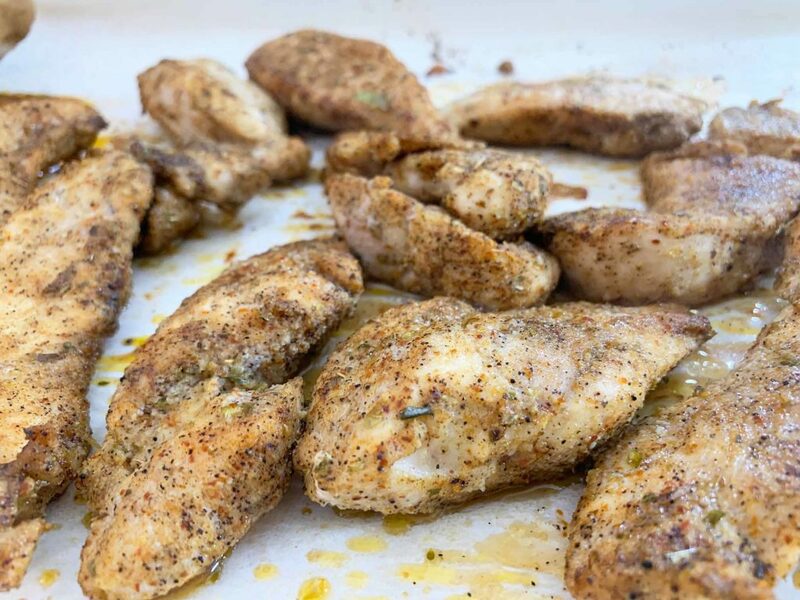 Lay the chicken on a parchment lined baking tray, drizzle with a little olive oil, and sprinkle on the spices. Roast the chicken at 375°F until cooked through. While your chicken is roasting, you can start on your veggies. 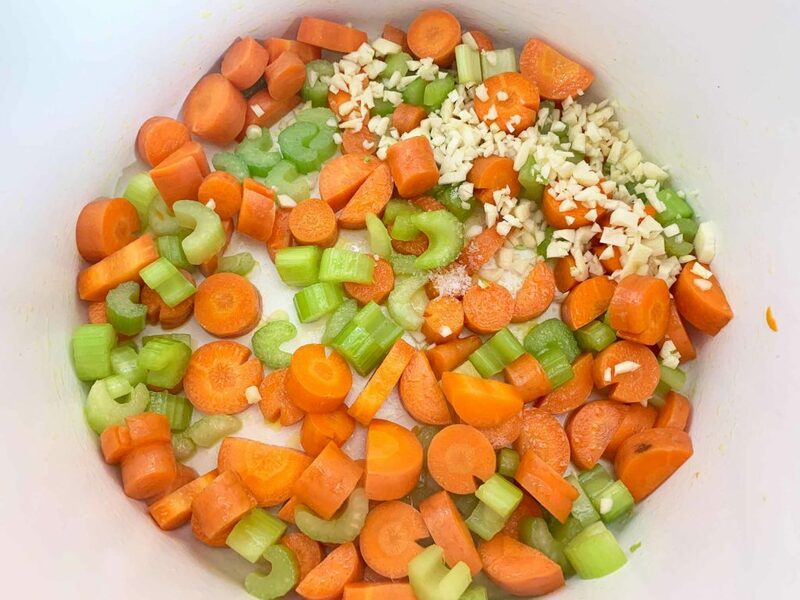 Heat up some olive oil in a large pot, and then add your chopped carrots, celery, and onion. Cook on medium high heat until the veggies start to get tender (about 8-9 minutes). Add a heap of chopped garlic and a big pinch of salt and cook for another minute or so. Add some water, chicken stock, and a bay leaf to your pot with the veggies. Turn up the heat so your soup comes to a boil, then add your dry pasta. Reduce the heat slightly and allow the soup to simmer for 10-15 minutes until the veggies and pasta are cooked. 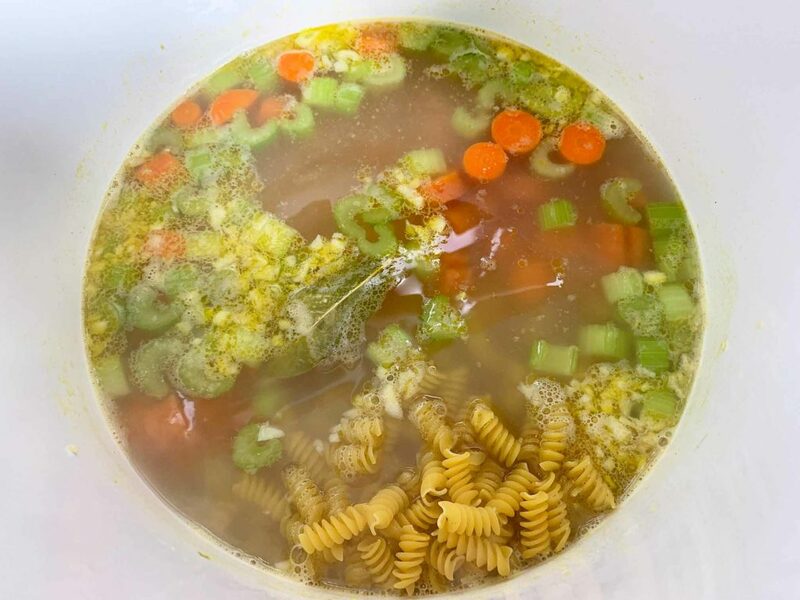 If you’re worried that your veggies might cook faster than your pasta, or vice versa, you can cook the pasta in a separate pot and then stir the noodles into the soup before serving. 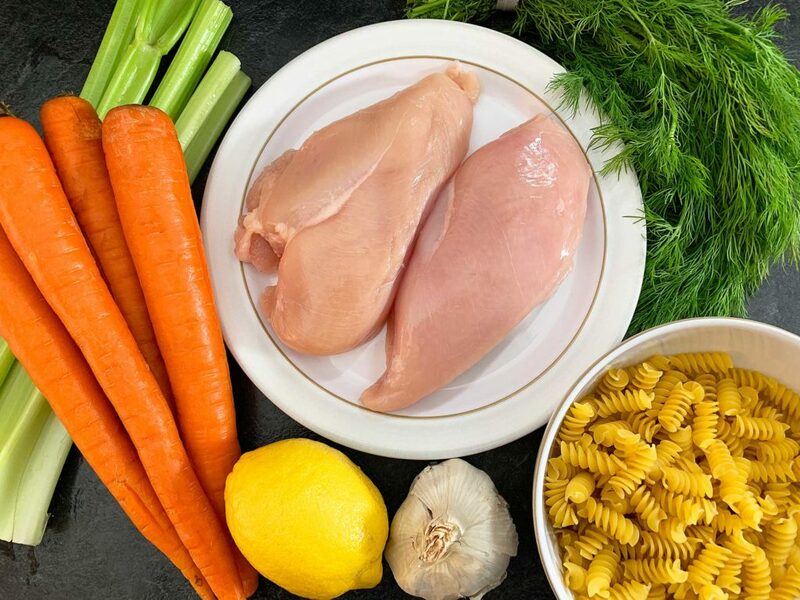 While your soup is simmering away, your chicken should be ready to pull out the oven. 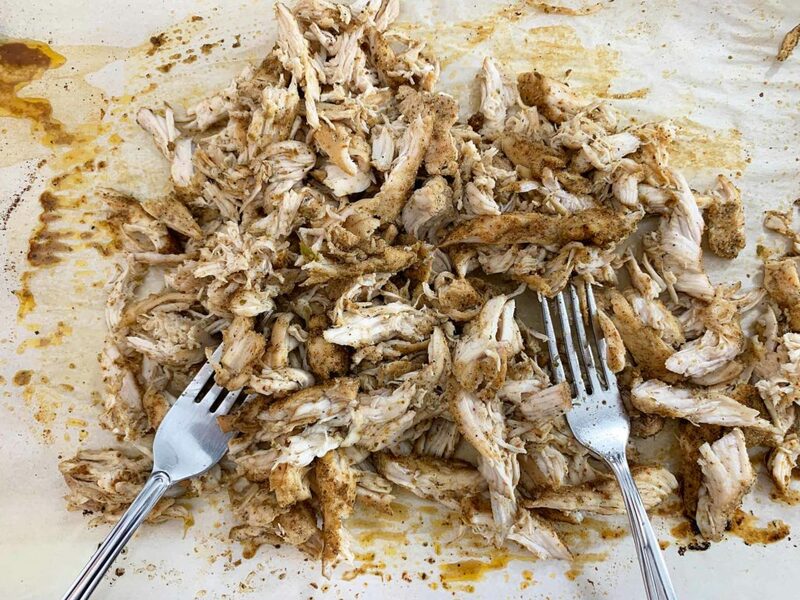 You can either dice up your chicken, or use a couple of forks to pull it apart and shred it. I kind of prefer shredding it, but that’s just me. Now go back and check on your soup. 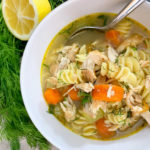 If your pasta and veggies are cooked to your liking, stir in the shredded chicken, a big pile of fresh dill, and some lemon juice. The dill and lemon juice are what really make this soup bright and fresh. I’d strongly recommend you don’t leave them out. The recipe calls for the juice from a full lemon. I’ve found that some lemons are definitely juicier and more lemony than others. I usually add about half a lemon’s worth of juice, or even less. Start by adding less, give it a taste test, and then add a little more if you feel it needs it. I’ve made this a couple of times where I’ve been a little over zealous with the lemon juice and ended up somewhat disappointed because the flavour was too overpowering. One thing to note is that the pasta will continue to absorb the broth the longer it sits. If you have any leftovers, you will notice that it will become much less soupy over time. Whenever I have leftovers of this soup, I add a little extra water to it before re-heating. If that’s not your style, you could also cook your noodles separate, and only stir in what you want to eat at the time you’re eating it. 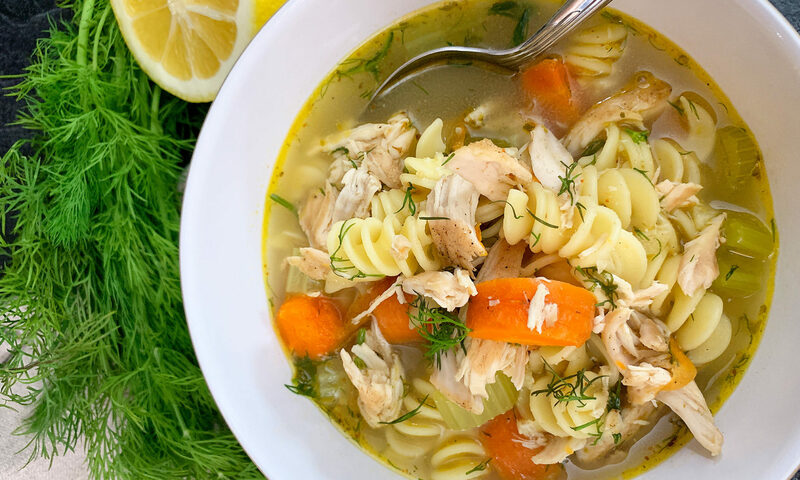 This delicious, one pot, chicken noodle soup is the perfect meal when you're feeling under the weather! Pre-heat your oven to 375°F. 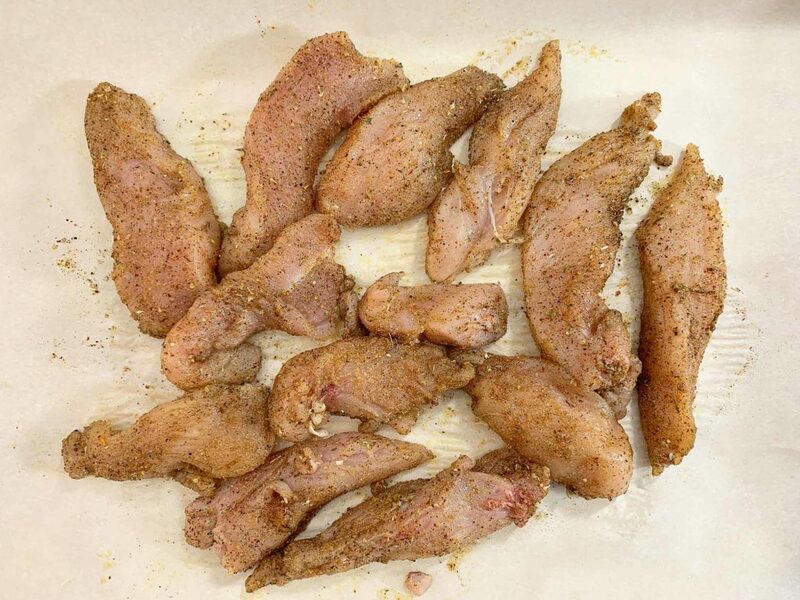 Cut the chicken breast into strips and place on a parchment lined baking tray. Drizzle with olive oil and sprinkle on all the spices. Bake until cooked through (about 25 minutes), flipping half way through. Shred or dice the chicken once cooked. Heat the olive oil in a large pot. Add carrots, celery, and onion. Cook until slightly tender (about 8-9 minutes), stirring occasionally. Add the garlic and salt. Stir and cook for another minute. Add the water, chicken stock and bay leaf to the pot. Bring to a boil then stir in your dry pasta. Simmer for 10-15 minutes until the pasta and vegetables are cooked. Stir in the cooked chicken, dill, and lemon juice (Start by adding a little less lemon. Taste the soup and add more if desired). Serve hot! 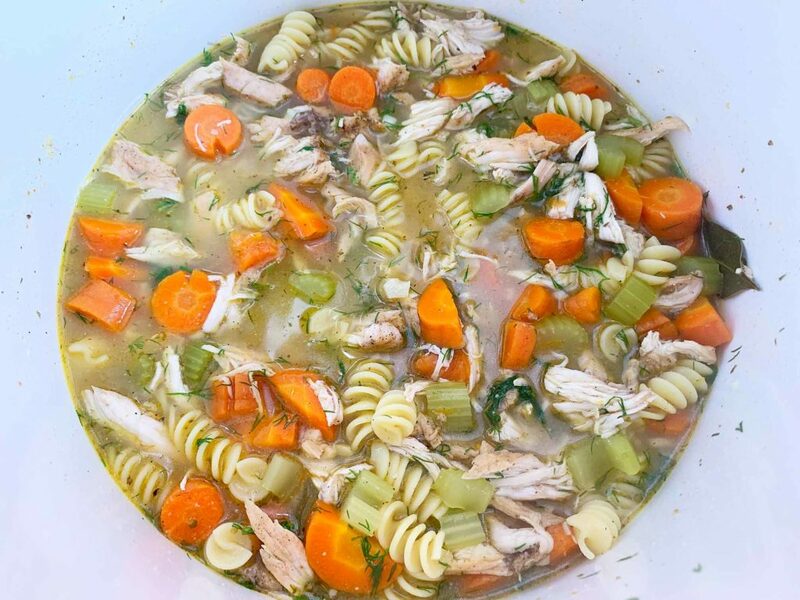 Recipe slightly modified from Baker By Nature - Flu Fighter Chicken Noodle Soup.